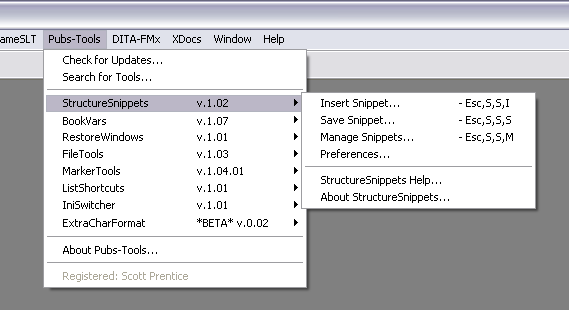 Structure Snippets is a plugin developed for FrameMaker 7.0 and above, and was designed to be used with structured documents. This plugin lets you save “snippets” of structured content that can be inserted easily as needed. One common use of a structure snippet is as a template for frequently used content. Snippets can be stored in a “Local” folder as well as in a “Remote” location on a shared server. This lets people define snippets that are only available for their personal use in addition to having the ability to provide snippets that can be used by a group of writers. Snippets can be inserted by selecting the entry name from a dialog box, or they can be inserted by issuing the specified shortcut keystrokes or selecting the name from the context (right-click or popup) menu. To install Structure Snippets, extract the installer application from the ZIP file, then run the executable file. If you are reinstalling, there is no need to uninstall the old version, but you may want to make a backup of the StructureSnippets.INI file to save your settings before a reinstall. For information about uninstalling this tool, see Uninstalling Structure Snippets. Please review the Known Limitations before using this plugin. Contact <tools AT leximation.com> with comments and questions. This documentation was last updated on 14 November 2009 for Structure Snippets version 1.02. Add a predefined snippet to your document. Save the selected structured content to a reusable snippet. Modify and delete Local snippets with the Manage Local Snippets dialog. Set preferences for the Structure Snippets plugin. Each Pubs-Tools plugin that you install adds a submenu to the Pubs-Tools menu on the FrameMaker menu bar. In addition to the tool’s commands, the submenu provides access to the tool’s online Help and “About” information. Use the Check for Updates command to check for updates to all FrameMaker Pubs-Tools that you have installed. Visit www.leximation.com/tools/ for information on the latest tools from Leximation. The Leximation, Inc. End-User License Agreement is available from our website at www.leximation.com/eula/.